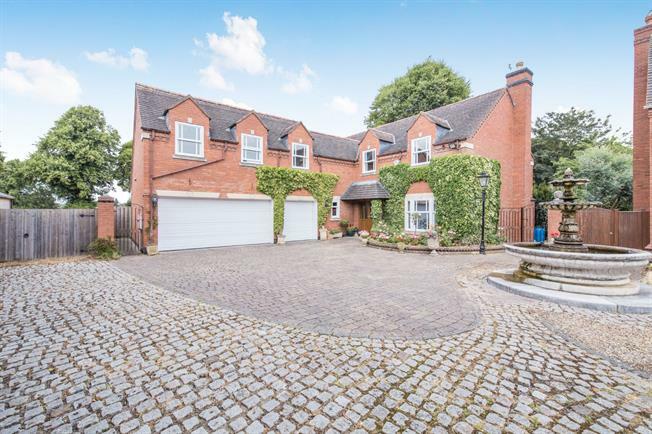 5 Bedroom Detached House For Sale in Leicester for Price on Application. This classy and exquisite five bedroom detached residence would make a fabulous family home and must be viewed internally to fully appreciate the size of it's accommodation. The house is situated in a quaint court and features off street parking and a water fountain which in our opinion giving the outside a holiday vibe with a tranquil, elegant feel to it. The triple garage has enough space for parking your cars in or could be a great storage area. Externally to the rear is a mature rear garden which could be great for hosting/ celebrating those special occasions in. Overall this house is positioned on a good sized plot and in a nice location. The accommodation in brief to the ground floor comprises of a reception hall, living room, dining area, study, kitchen/breakfast room, utility and WC. To the first floor are five bedrooms, two en-suites and a family bathroom. UPVC front and double double glazed door. Radiator, parquet flooring. Wooden back double glazed door. Radiator, carpeted flooring. UPVC back double glazed door. Double glazed wood window facing the rear. Radiator, tiled flooring. Work surface, wall and base units, single sink, integrated electric oven, integrated electric hob, overhead extractor, integrated dishwasher. Wooden side double glazed door. Double glazed wood window. Radiator, tiled flooring. Work surface, base units, single sink, space for washing machine. Double glazed wood window facing the side. Radiator, carpeted flooring. Double glazed wood window with obscure glass. Radiator, tiled flooring. Low level WC, wash hand basin. Double glazed wood velux window. Radiator, tiled flooring. Low level WC, single enclosure shower, wash hand basin. Double glazed wood velux window. Radiator, tiled flooring. Low level WC, corner bath, single enclosure shower, wash hand basin. Double glazed wood window. Radiator, tiled flooring. Low level WC, corner bath, wash hand basin.